What started as a requirement for high school graduation has become ‘true love’ for this student. Now, Franz continues his love for research as a BS Biology student in SU, fueled by his vision for the Philippines. Meet DOST and SUAKCREM scholar, Franz Anthony Alejano. Natural resources are growing in abundance. Species are multiplying. The development in cities is sustainable. The best part: this all happens in the Philippines. Franz, during his first semester in Silliman University. At the age of 19, first year Biology student Franz Anthony Alejano has this vision to defend. This radical change – where the Philippines prioritizes the environment and the well-being of future generations of Filipinos – is the change Franz wants to work towards. This is his dream. Franz realized this dream as a student in Negros Occidental High School, when he was required to make a research paper. His first study was on an improvised HKAFO (Hip, Knee, Ankle, and Foot Orthosis), an invention designed to help patients with lower limb weaknesses. It sparked his interest in research until he decided that he wanted to focus on biology and biodiversity. The next study he did was to test the capability of fish mucus to be used as a lysing agent in DNA extraction, followed by a study on endoparasites of selected captive endemic threatened species on Negros Island. He has also done the same study but on the flying foxes of Mambukal Resort Bat Sanctuary, then a research on microplastics on the coastline of Bacolod City. These experiences opened doors of opportunities for Franz. In April 2016, Franz and his group presented their study on endoparasites at the 25th Philippine Biodiversity Symposium. 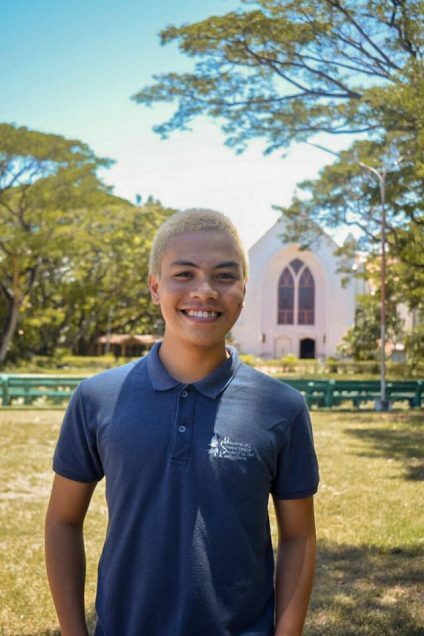 Franz also participated in the Provincial Student Biodiversity Symposium last November 2017 where his group won third place, making them the only high school group among college students in the top 9. By the time Franz graduated high school, he was determined to become a scientist with the heart of a conservationist. His love for research is fueled by the change he wants to make through science. “I love science and its potential to change and create things,” said Franz, who believes in the power of science coupled with service to improve communities and the environment. Franz also made sure he learned as much as he could about sustainability and conservation by joining events and meeting individuals who share the same vision he has for the world. It was in one of these events where the dreamer met the scientist who would change his life. 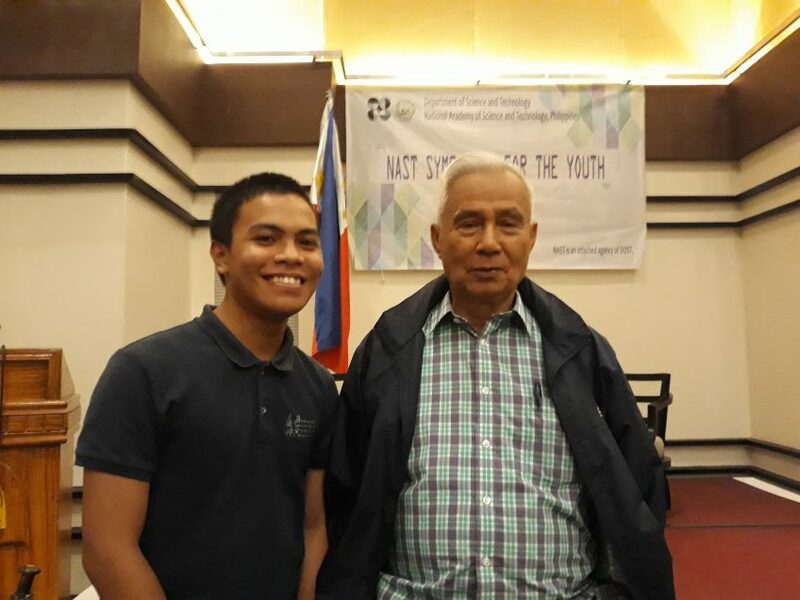 Franz first met Dr. Angel Alcala, National Scientist, during the National Academy of Science and Technology (NAST) Symposium for the Youth, April 10, 2018 in Bacolod City. Franz met National Scientist Dr. Angel C. Alcala at a conference symposium for the youth with National Scientists organized by the Department of Science and Technology (DOST). The encounter became a turning point, as Franz had been considering universities where he would continue his education and had been applying for scholarships left and right, but was still unsure which university was best for him. Aside from that, he also worried about his family’s financial capacity to support his college education. The Bacolod native told about growing up in a simple household dependent on his mother’s meager earnings as a home-service manicurist. “If my mom can’t work, [even just] for a day, we would go hungry,” he said. His father, on the other hand, was doing odd jobs: as a jeepney barker, an electrician, a security guard, and a vendor. It did not help that his parents had health conditions: his mother’s lower limb weakness, which they feared might be undiagnosed polio, and his father’s tuberculosis. Franz saw his parents’ dedication to provide for him and his younger sister despite their circumstances, and understood that their dreams had become their parents’ dream, too. His parents’ earnings were enough to sustain their daily needs, but college was a different question. When Franz talked to Dr. Alcala during the DOST event, it came to a point where Franz asked what has been on his mind as a graduating high school student, eager to take the next steps to achieve his vision: Where is the best school for marine biology in the Philippines? The Sillimanian scientist’s response was no surprise. Franz knew about Silliman University, but doubted that his parents could afford to send him there. Dr. Alcala encouraged him to apply for a scholarship, and he did. After they met, Franz wrote to the SU Angelo King Center for Research and Environmental Management (SUAKCREM) and to Dr. Alcala, applied for their scholarship program, and told them his story. He then decided to enroll in Silliman with his DOST scholarship and a scholarship from SUAKCREM. It is in SU where Franz finds a place for his dreams as a scholar. Still in his first year, Franz admits it has been a challenge for him so far to find the right balance between his studies and extracurricular activities that are also in line with his advocacies, but it is a challenge he is set on overcoming. “I think college life is like a battle between yourself and your dreams, but I want to defend my dreams. I do not want to let my dreams lose,” he said. Like sea turtles (Franz’s favorite animal), dreamers like Franz seem to be an “endangered species” in a society where more lucrative professions—lawyer, doctor, engineer—are preferred and pursued. “Unlike some who take up Biology as a pre-med course, I chose Biology because I want to become a scientist,” said Franz, who decided to choose Biology over Marine Biology because he wants his knowledge on biology to be multifaceted. Someday, he hopes to be like Dr. Alcala and other Filipino scientists who have contributed to the conservation of the country’s biodiversity. In the life cycle of a sea turtle, Franz is in what we call the “lost years,” when sea turtles swim away from their coastal birthplace to venture into unknown waters before returning to the coast. Franz admits missing home and arriving from school to the comfort of his parents, but also acknowledges that his time in SU is a time of learning how to ride the waves and find his current as a young sea turtle adapting to independence. 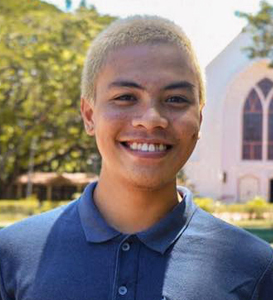 In the halls of Silliman, Franz continues to defend – and build up knowledge – that will enable him to pursue his vision.